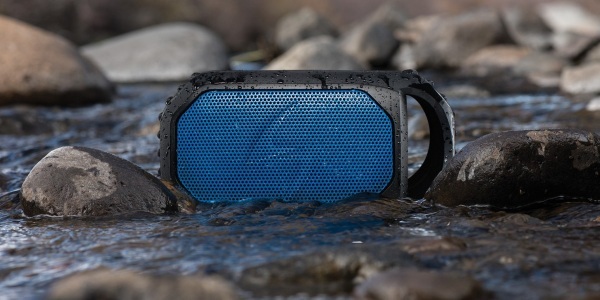 Your average person is probably OK with using a standard Bluetooth speaker outside. They don’t need waterproofing or the ability to mount it to anything. The Ecostone isn’t built for your average person though. This Bluetooth speaker was made for the person who needs music in their very active life. The Ecostone isn’t water resistant, it’s waterproof so in case it falls into a pool or over the side of your kayak, not to worry, it will be fine. Plus it floats so you won’t have to go diving for it if it does fall in. It also comes with a built in LED flashlight so it can pull dual duty in the dark. It comes equipped with a mount so it can be attached to things or just clip it through the handle to your backpack, bike, or shelter made from natural materials you found in the forest. It has up to 12 hours of battery life and can be recharged via computer or power cord. It can be used as a backup battery and charge your smartphone in a pinch. The Ecostone is the perfect outdoor speaker and can be snatched up for $149.